I’ve been thinking some more about the metaphorical and material qualities of salt, and exploring these through journeys both far-flung and nearer to hand. This summer I went on a 26 day trip across Germany, Lithuania and Russia, accompanied by my sister Rebecca and for a short period by our father William. The aim of the trip was to track down some of the sites related to our family history and try to discover more about where family members might have lived before they migrated to the UK and South Africa. Our first stop was Germany where we visited Kassel to see the Documenta exhibition, and then on to Hamburg where we know that our Great-Great – Grandmother Anne and her father Nicholas Filaratov lived for a few years before coming to Hull. It was great to experience a port city that whilst it has seen extensive changes still retained some of the original warehouses. Going out of town to the emigration museum we found an area which was still very much a stopping place for current migrants – it felt cut off from the rest of the city and we had an adventure trying to walk back into the centre via motorway bridges, construction sites and abandoned wastelands. Then we travelled by ship from Kiel to Klapieda and on by bus to Vilnius, Lithaunia. Concurrently to our actual travels we were making virtual links with the diasporic family on Geni.com, and Jewsihgen.org and through these sites we found that our very distant ancestors the Meisels had in fact lived in what was at the time the Vilnius Jewish area (later the ghetto, and now the heritage site of the city and full of boutique hotels and gift shops). After a very unproductive although comical visit to the archives where we failed to learn very much excpet that records relating to certain years were kept in other places they werent sure where exactly, we decided to use a more esoteric method of locating our ancestors homes. Using a necklace purchased in the “Russian Market”, I dowsed the streets of the Jewish area, until eventually on a patch of grass I got the answer we were looking for. There we sprinkled salt in a line, marking the possible threshold of the home of our forebears with salt brought back from South Africa via England, the reverse of the route of migration of our family. From Vilnius we travelled onwards to Rokiskis, a small town in the north of the country, and a neighbouring village Obelai, where we had information the Beinart family had lived up until the early 1900s. As we drove North, the urban sprawl gave way to fields, lakes and wooden houses. Through talking to a Jewish Genealogist in the US via skype, we found out the locations of the Jewish cemeteries in Rokiskis and Obelai, and thanks to a local guide we met at the Tyzenhaus museum in Rokiskis, we were able to track down the sites. Whilst walking the streets of the villages we had found it hard to find any traces of the once thriving Jewish community, as subsequent layers of occupation and use had all but buried the memories of the former inhabitants. But in the overgrown, half-hidden cemeteries it was possible to make out hebrew letters on the half-fallen over tombstones, and the lack of overwriting by anyone else gave us easier access to our ancestors’ past. Here we decided to echo a performance (and film) we had made in the salt pans of Darling, South Africa two years ago, called Offere. 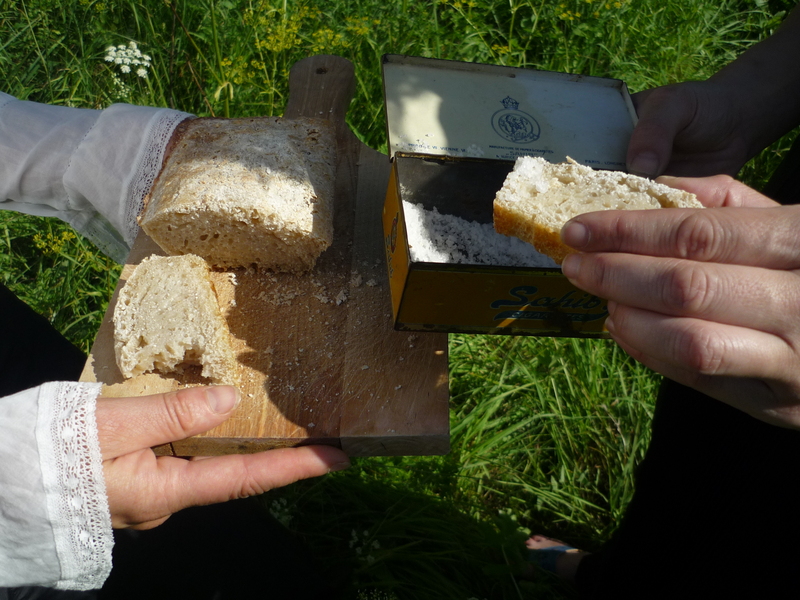 We offered bread and salt which had come from the pans to each other, and to the ghosts in the graveyard. The stale salty bread reminded us of the dry salt pans and brought a sense of the journey we had made, the reverse journey of our forebears, into the space they occupied. We then travelled onwards by overnight train for the final stage of our journey, to St Petersburg. This was the furthest point back we had traced the Filaretovs to, but despite the best efforts of our friends Olga and Misha and a fairly fruitless trip to the Russian state library, we were unable to identify further where they had lived, or what they had done. However, we discovered by chance that the street we were staying on had been the centre of the St Petersburg Jewish community over 100 years ago, and we decided to leave a trace in salt in memory of the mysterious Mr Filaretov. The cyrillic symbol for ‘F’ is also, curously, the alchemic symbol for salt (turned sideways) and the symbol for the golden ratio. 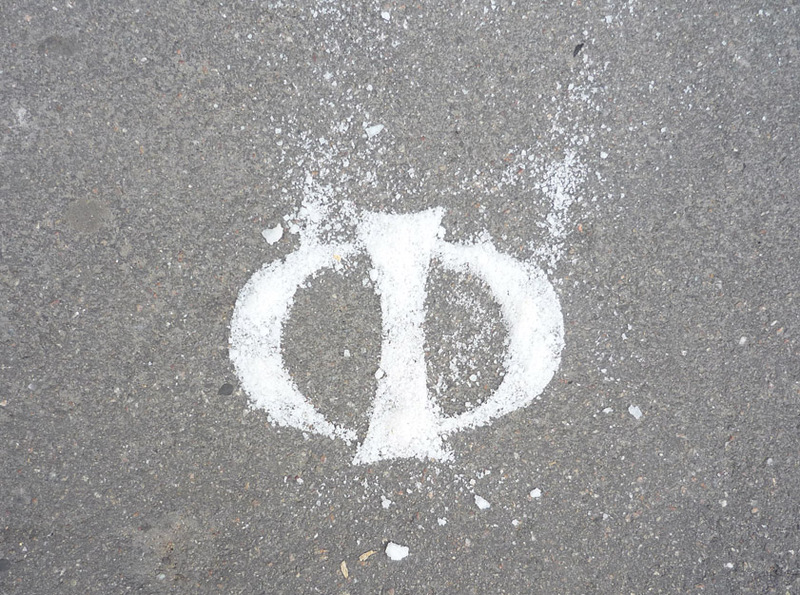 We left a salted F on the pavement of Galernaya Street, a small sign of our presence and the transient presence of our ancestor.